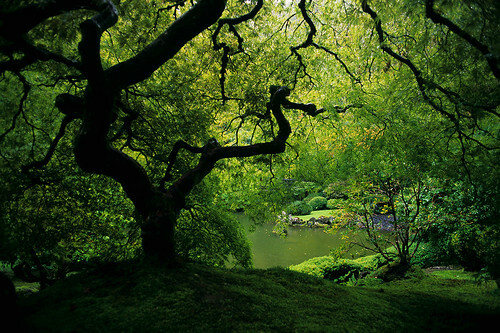 For over fifty years the Portland Japanese Gardens have been a gem in the city and a place of beauty and tranquility. Built in the 1960s, the Japanese Gardens were conceived as a means of healing ties between the U.S. and Japan. Today they are recognized as one of the most authentic Japanese gardens outside of Japan. The gardens attract tens of thousands of visitors each year. In this class you will get to experience these gardens at the height of their summer green. Spend several dedicated hours in the gardens learning how to appreciate their aesthetic and translating that into photography. This class is open to photographers of all skill levels. It will include hands-on learning of topics ranging from basic photographic fundamentals such as exposure and composition to more advanced photographic topics such as vision and how to make images unique to your experience. The class will feature a follow-up session for review, sharing and critique of images made during the outing. My adventures with photography began back in 2001 with a waterfall and a Pentax K1000. Since then it has been a near-nonstop journey. I use my cameras to teach me how to see the world more keenly, to appreciate details and subtleties to a greater extent, to enjoy the fine, yet passing, qualities of light and time. I invest myself more in the process of photography than the results. These days I spend most of my waking hours managing at Blue Moon Camera and Machine, a quirky and dedicated film camera store in Portland, Oregon. I also spend many a weeknight teaching beginning photography classes at Newspace Center for Photography. It is a rewarding undertaking to light fires in eager new photographers and see how they burn. Over the years I have experimented with many different cameras and genres of photography. I try not to pigeonhole myself and never tarry too long in one particular corner of the photographic universe but I am fond of working with pinhole cameras and using ND filters for super long exposures on my Hasselblad 500C, a camera older than I am I might add. I am an advocate for photographers using their powers for the good of all. My proudest moments have not come from being published, having gallery shows, or the selling of prints. My proudest moment came in 2014 on the Turkish/Syrian border where I had volunteered to teach pinhole photography to Syrian refugee children as part of a program to use art and athletics to help these children deal with the trauma of their situations. Other proud photographic moments have included volunteering during the weeks before Christmas to make nice studio portraits of homeless men and women in order for them to have prints to keep or share and the time I organized several of my photographer friends into a print auction to raise money for charity to assist in the aftermath of the 2011 earthquake and tsunami in Japan. I do believe that photographers are more than the photos they make.